We won’t lie: This infographic, created by Section Design for the Japanese publication Courier Japon, is just a wee bit visually confusing, but it does add a very important insight about the way Apple sees innovation. The iPad has been billed as a “magic” product, unlike anything else on the market. 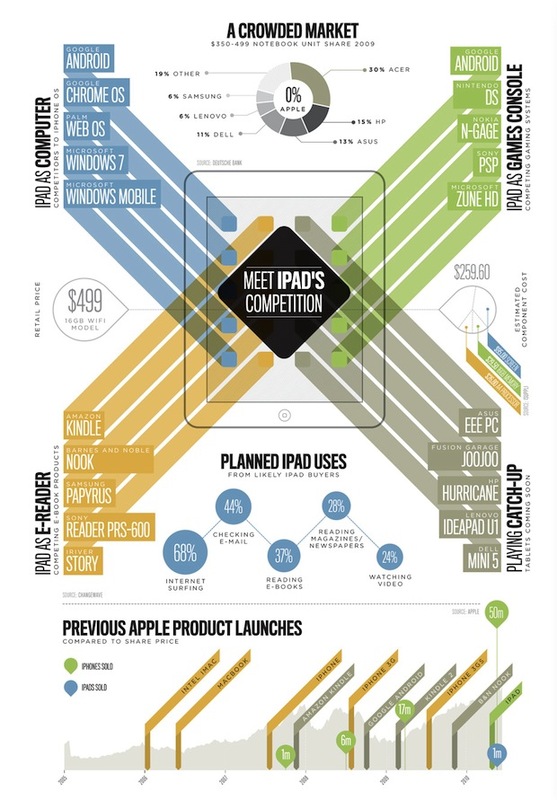 But this infographic really highlights that the iPad is actually faced by competition from myriad products that are almost like it, which kind of do the same thing. Classic business strategy, courtesy of gurus such as Clayton Christensen and Michael Porter, argues that smart business always pursue markets with the least number of competitors. Apple, by contrast, is aiming to have the most competitors. The iPad is close enough to all those other products, but just different enough to be considered in a category of its own. That sort of innovation dynamic rarely happens in any other industry, and the only reason it’s seen in consumer electronics is that a computer can do so many different things through a simple interface. That fact alone should be enough to upend a lot of thinking about how consumer tech products compete with each other.. Looking at the data from the bottom of the infographic, apparently 68% of people plan to use it for Web surfing, while only 28% plan on using it for reading magazines. That’s astounding: You’d think either of those uses would be better served on another specialty device. But, through design and marketing, Apple makes all those products look as if they’re somehow lacking. Magic, indeed.